Laney College might be the A’s’ preferred site for a new ballpark, but for many Oakland residents who live in the area, it’s the least-preferred option. Councilmember Abel Guillen, whose district encompasses Chinatown and Eastlake, has heard from a lot of residents like Chen. Guillen told the Express that half of his constituents who have contacted him about the A’s’ plan don’t support the Laney location. And most of the other half, the supporters, want more information about possible negative impacts, he said. As a result, he asked the Oakland Planning Commission to devise a menu of “interim development controls” that would limit harmful speculation. Planning department staffers are proposing that the city create a special zone of roughly 120 blocks around Laney that would be protected by an emergency ordinance limiting demolitions, banning new parking facilities, making it more difficult to convert apartments into condos, and requiring all large projects, specifically new hotels, to obtain conditional use permits, which require public hearings. Developers would have to send notices to both property owners and tenants who live near their projects so that everyone can weigh in about impacts. Currently, only property owners get such city notices. And the mailings would arrive in Cantonese, Mandarin, Vietnamese, and Spanish, in addition to English, which is the current default. Furthermore, community organizations are asking the city to implement stronger tenant protections in the surrounding area, something Guillen said he supports. But a plan hasn’t been devised yet. Would this be enough to limit speculation and protect the existing community? “Somebody’s almost surely going to lose,” said Dennis Coates, an economist at the University of Maryland, Baltimore who studies stadium projects. Coates said the ballpark would “certainly” change the character of the surrounding neighborhood, including its demographics. But he also said it’s hard to predict if existing residents will be displaced or whether they will simply see the neighborhood change around them. “The question of whether it will be a gentrifying force isn’t really about the stadium so much as what developers do in the surrounding areas, and what the stadium developer has the right to do in the neighborhood,” Coates explained. In other words, what matters most is how the city allows the surrounding area to be redeveloped going forward. Eric Van Holm, another researcher at the University of Arizona who studies stadiums, echoed this conclusion. “If you’re a landowner near this project you will benefit substantially,” he said. But both experts say the ballpark’s potential effects on housing will be complicated and difficult to predict. Van Holm said renters have good reason to fear the stadium, but at the same time, rent increases around other newly developed sports complexes “generally move slowly.” At the same time, if local rents do go up because of the ballpark, it could make market-rate housing projects on nearby empty land more feasible. This new supply could dampen local price increases, said Van Holm. “Possibly, you’re going to price out of the market the low-income people who live in the neighborhood,” said Coates. However, at last week’s planning commission meeting, commissioners almost didn’t approve the interim development controls Guillen wants for the neighborhood. “It’s important to understand what’s already in the pipeline,” said Commissioner Jonathan Fearn, who opposed the regulations. “People have already invested time and money,” he said about developers whose projects could be impacted by the temporary restrictions. But Strategic Planning Manager Ed Manasse said the planning department studied all of the projects currently in the development pipeline in the area that would be affected by the interim controls and said no existing project would face any greater hurdles to gain approval. The controls would only limit new applications made after the A’s’ announcement. Even so, the Jobs and Housing Coalition sent a letter to the commissioners blasting the proposed ordinance as a “potential three-year moratorium on development in the area,” and asking that it not be implemented. After some debate, the interim controls, with a few modifications, were approved by the commission and forwarded to the city council for consideration. The council could vote on them by Dec. 12. Tenant activist James Vann submitted a letter to the commissioners calling for “blanket prohibitions” on the assembly of parcels by developers, demolition permits, and other activities in the area, in addition to temporary prohibitions on no-cause evictions, all rent increases, and transparency measures that would show who’s buying and selling real estate around the stadium site. So far, the A’s have said they plan to build affordable housing and offer benefits for the neighborhood, but details are lacking. Chen said she just doesn’t see a way that the ballpark and the existing community can coexist and wants the A’s to reconsider the Coliseum site. She also doubts the city’s interim development controls, as they’re currently drafted, will do enough to prevent a speculative frenzy. The Oakland Coliseum’s Uncerta… Prosperity or Displacement? 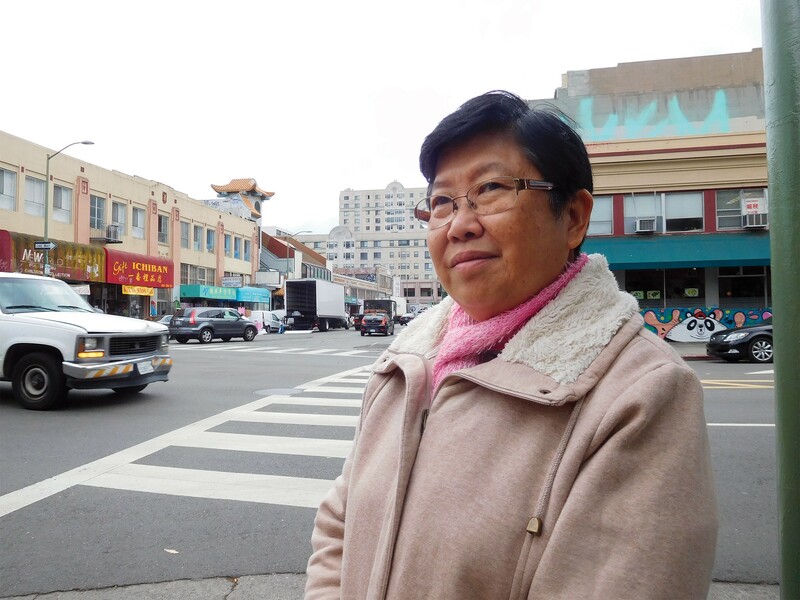 Some Eastlake and Chinatown businesses are optimistic about the new A’s ballpark, while others worry that it won’t lift all boats.